The Pantages Apartments in Seattle epitomize sustainable, green building from roof to foundation. 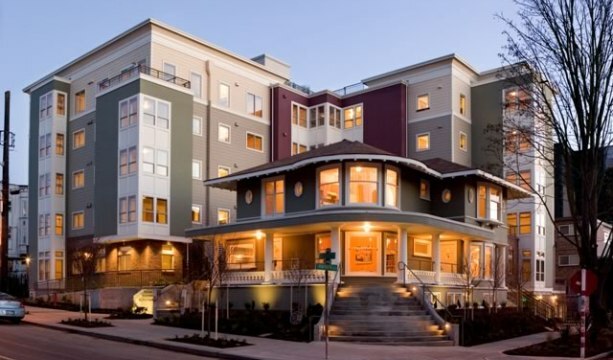 General contractor Walsh Construction, Seattle, utilized 13 sustainable strategies and various contemporary materials to ensure long, energy-efficient life for the 49-unit building, as well as a healthy environment for residents. One product used to meet local green building criteria was MemBrain™ SMART Vapor Retarder by CertainTeed, a transparent, variably permeable polyamide film installed with unfaced fiberglass insulation. Aside from its ability to change permeability with humidity fluctuation, allowing excess moisture to escape, project architect, Ron Hopper, Associate Principal with SMR Architects in Seattle, says that ease of installation and inspection led him to specify MemBrain. Since MemBrain is a newer product, Walsh Construction project superintendent Jeff Nelson says there was a bit of a learning curve with installation. However, with the growth of green construction, permeable vapor retarders are the way to go, he says.